Either I am feeling extra jaded lately (a very distinct possibility) or there are even more frogs* than usual crowding the department store perfume counters this spring. Today, I've got quick reviews of two recent mainstream fragrances (Oscar de la Renta Something Blue and Kate Spade Live Colorfully), but as neither is likely to set perfumanity on fire, I'll go ahead and put my quick poll question at the start: have you smelled any really great new mainstream scents this year? Do tell. If you can't think of any, go ahead and tell us about a new fragrance that's just comically bad. Something Blue is Oscar de la Renta's bridal-inspired fragrance for spring 2013 — the tag line is 'from this day forward' and the bottle includes a removable ring — and as you'd expect, it's a romantic floral. The opening focuses on one of my favorite floral notes, linden blossom, with accents of lily of the valley and stephanotis as it moves into the dry down. And it is pretty, with a slightly green tinge and just the barest touch of sweetness. "Soft" and "elegant" are the words that appear in many of the online customer reviews, and they're both apt enough. Something Blue is also clean, not quite but almost soapy clean. It didn't remind me of laundry detergent, really, but it's certainly far cleaner than I'd want for my wedding. Verdict: it's exactly what it ought to be — it's an entirely of-the-moment mainstream wedding fragrance. If you're looking for just such a thing, and want something that will hang on through the event but not alarm your wedding guests, it is definitely worth a shot. It probably goes without saying that it isn't likely to be a perfumista favorite, right? Another mainstream alternative, more strongly floral than this, is the old standby Vera Wang for Women (the original 2002 version) or if you want something stronger still, there's always Estee Lauder Beautiful. Or, check out Angela's article on Wedding Perfumes. Oscar de la Renta Something Blue was developed by perfumers Frank Voelkl and Ilias Ermenidis. The notes include bergamot, mandarin, neroli, linden blossom, stephanotis, lily of the valley, narcisse, lychee, cashmere woods, ambrette seeds, vanilla and white musk. It is available in 50 and 100 ml Eau de Parfum, and in a matching candle. Live Colorfully is the latest from Kate Spade. It's the brand's second scent under licensing arrangements with Elizabeth Arden — the first was the eminently forgettable Kate Spade Twirl, and possibly that explains why this one was done in-house, with the assistance of consultants Fabrice Penot and Edouard Roschi of Le Labo and Poppy King. Live Colorfully starts off with some decent sparkle (it makes a nice showing on a blotter) and settles into a light floral with a tropical bent. There's some clean gardenia, and some coconut — but it's not heavy enough to qualify as suntan lotion, really; if you want beachy, you might better stick to Estee Lauder Bronze Goddess. Live Colorfully is slightly aquatic, but not overly so, and has a warm and summery woody dry down. It does fizzle out a bit after a few hours, but what doesn't? Verdict: While I can think of quite a few tropical florals I'd prefer to this one, it's perfectly wearable. Gaia at The Non-Blonde concluded that she wouldn't "...object to smelling Living Colorfully on other people here and there", and I'll go for that. It's better than I expected after Twirl, but maybe not as great as I might have expected given the involvement of the folks from Le Labo. And again, it's not likely to attract a cult following of perfumistas. 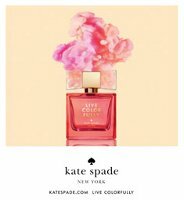 Kate Spade Live Colorfully is available in 50 and 100 ml Eau de Parfum and in a 10 ml rollerball. The notes include mandarin, pink water lily, star anise, tiare flower, gardenia, coconut water, sheer amber, musks and vanilla. * As in "you have to kiss a lot of frogs". Yeah, this really hasn’t been mainstream’s finest hour. I’ve heard about two good mainstream perfumes, but haven’t tried either: Marni and the new Tom Ford Sahara Noir. I don’t know if the Gorilla Perfumes count as mainstream (they’re even cheaper than mainstream! ), but I haven’t gotten to try them, either! Buuut, I think an exciting development is that the very mainstream Sephora has been acquiring quite a few niche lines this year! L’Artisan, Atelier Cologne, Tom Ford Neroli Portofino, and some Bond No. 9s. I know that not everyone is pleased about this (reduced exclusivity and whatnot), but I’m very happy because Sephora always offers the smallest bottles on the market. Does your Sephora have any of those perfumes though? Mine doesn’t — was wondering if they were online only. The Baltimore Sephora has Neroli Portofino, Bond No. 9 Mother’s Day (which will presumably be phased out soon) and the Atelier Cologne minis (7 ml Orange Sanguine and Vanille Insensee). I bought a Vanille Insensee to show my financial support of the line! Good to know — thanks! I will have to look for those Atelier minis, those would have suited me better than the 30 ml bottles I bought. Ooh good to know about those Atelier Cologne minis. I need to get by Sephora and see if mine has them. Ooh somehow the L’Artisan addition to Sephora had escaped me! Thanks for the head’s up! It hasn’t been a good year for men’s launches either. I totally agree. Nothing that would seriously grab my attention was released this year so far. Well, Marni of course is excellent! Other than that I haven’t given skintime to a mainstream scent worth mentioning. That having been said, on TESTERS and on first sniff Dahlia Noir l’Eau smelled promising – so much pretty green! AND La Petite Robe Noire *EDT* smelled surprisingly great on a tester, it seems closer to the original’s tasty berry tartlet accord than the 2012 reissue into which Wasser substituted a more conventional cherrychouli. White musk in the EDP has been replaced by a sheer woody-amber base. I hope Marni isn’t going to be the best of the year…not because it isn’t good, but because it came out in January after all! Hope we’ll get something else decent. And thanks — I will definitely check those out. Maybe Dahlia Noir L’Eau will be like L’Eau de Chloe: better than the original. Ah, a good aspiration for Dahlia Noir l’Eau–I would very happy for an improved version of that one! Same mag had a strip of Bottega Veneta Eau Legere and that also smelled promising. Ha, congrats on your win even if you don’t adore it. Looks like Marni is going to be the winner today. Oh, I agree, actually, Liliana is really quite nice on the start, and then fades to nothingness/boringness. So far, although I haven’t smelled the women’s version, Adam Levine gets my vote. I liked the men’s version quite a bit. Marni was good, too, although I tend to think of Macy’s and Sephora as carrying more mainstream offerings than Saks. I’ll be interested to try both of these – Twirl was terrible, but LC sounds more promising, and I will try anything with linden. Wow, really? I will look for the Adam Levine. I’ll try anything with linden too. I keep meaning to see if the D’Orsay is still good. I sniffed Marni and loved it on the blotter. But it turned nasty sour on my skin. For me, so far the mainstream winner has been (blushing, glances around to see if perfumistas are laughing at me) has been The One Desire. It smells similar to Prada Candy on me, but much better. Hey, I keep meaning to try The One Desire — I did hear it was more interesting than The One (regular). Shame about Marni given how slim the pickings are this year! Just sniffed this today in Ulta (they are offering a free gift with purchase, though I forgot what it was!). It was quite nice. Reminded me slightly of something from the 90s that I can’t quite recall. A little sweeter/heavier than what I am looking for at the moment, but not bad at all. The only one I’ve sampled recently that might qualify as mainstream is Chanel’s 1932. My reaction was pretty meh…but sounds like it’s at least better than Live Colorfully. Yup, if it qualifies as mainstream, then it has to be Marni. Last year I quite liked AA Lys Soleia so has anyone tried this years neroli one? On paper, it sounds quite nice. I haven’t…haven’t even seen it yet, seems like they’re usually in sephora by now, but no sightings this year. I never even saw Lys Soleia… I think it only came to larger markets, and was online. Oh, too bad…I did think it was nice. My Sephora never got it either – would have liked to sniff that one given the reviews. Marni gets my vote too, but honestly I haven’t tried anything else mainstream released this year. I haven’t really explored the Aqua Allegoria line, but a neroli one does sound tempting. I know my Sephora carries at least some of them so I’ll have to look for it while I’m looking for Atelier Cologne minis. They are worth a shot — I really like a few of them. I join you on the Lys soleia: I really like it! I also really enjoyed the new Nerolia Bianca. The best OB opening I’ve smelled in a looooooong time. Really great, IMO. The drydown fails me a bit though, but I think just because I have an issue with some white musks (utter dislike!) and I can’t really justify a FB if a perfume doesn’t have a rich base. I think any lover of OB should try this AA. The first half an hour is glorious. Thanks, Zazie, that sounds great so I’m going to check my local Debenhams to see if they have it yet. Good to hear a review, thanks! Sorry to hear there’s more white musk…Guerlain has become very fond of white musk. Nerolia Bianca is very good but is strongly reminiscent of 4711. Not a fan of white musk but it doesn’t bother me in this one, unlike Idylle original which does bother my nose. P.S. BTW: there is no musk in Nerolia Bianca! Well, they might not list it among the notes, but to my nose it is VERY much there. Like – body shop white musk there. But I might be wrong of course… Wouldn’t be the first time! Curious why you think there is no musk? That’s highly unlikely. I looked up the ingredients on Fragrantica because I didn’t think there was any white musk in Nerolia Bianca. It doesn’t list it so because I can’t smell it in it and I’m assuming it’s not in Guerlinade, I concluded that white musk is absent. Hmmm. Most fragrances have musk — does not seem very likely that it isn’t there just because it isn’t listed. Something Blue actually sounds like something I might like – I tend to go for the tamer stuff anyway and like linden. While it wasn’t for me, I think Bottega Veneta Eau Legere was nice – that’s almost mainstream, right? Niche, which to my mind is primarily sold in boutiques, although there are some “crossover lines” that are mostly in boutiques but also in some high end department stores — Diptyque, L’Artisan, etc. Ah. I look at it a different way…Comme des Garcons is niche to me even though they also make clothes. But you can also think of things like the Hermessences & Chanel Exclusif lines as something like “niche from mainstream”. Oh, I think that’s mainstream…I include nearly anything that has primarily department store distribution, even if it’s only in the more high end department stores. And it was nice! I tried Something Blue… I found it very much along the same lines, although nicer than, the previous Oscar de la Renta release, Live in Love. Since the relaunch of the line with Esprit d’Oscar, it seems like they’ve been struggling to find their market niche. For me, I think the Oscar de la Renta Essential Luxuries, if those qualify as mainstream, are some of the best stuff mainstream-y of the year. But being an exclusive collection, maybe it doesn’t qualify. I haven’t tried Marni, Adam Levine, or Jimmy Choo Flash, but those are all things that are new that I’m moderately interested in trying. I think those Essential Luxuries count as mainstream, but I haven’t tried (or even seen) any of them yet. I do think Esprit d’Oscar was really well done, nicer than Something Blue. Adding a Marni vote. I find myself wearing it more than most anything else. It really is a winner. I had to pick up a bottle of Givenchy Gentlemen Only and am loving it. Got Jour ‘Hermes for Mother’s Day (after running through several samples to make sure it was worthy of ownership) and really love it for our hot LA spring. It seems this season my new perfume experiences have been totally erratic and confusing because I have had such a wretched on again, off again cold. Now that I launched into this possibly very boring story, I just realized the perfume in question is probably a late 2012 launch and not a 2013 launch… but anyway… so I was in Nordstrom’s a couple of months ago chatting with a woman at the Chanel counter and she whispered conspiratorially so me, “You HAVE to try this new Chanel…” and proceeded to douse me in something I couldn’t smell… So off I go to the next shop, a shoe store, and people are staring at me, coughing, rolling their eyes… at first I thought I was just being paranoid… then a customer says to me, loudly, “Wow. That is some perfume you are wearing.” And to make matters worse, three other customers nodded in agreement, not smiling. So back to the Chanel counter I did go (“as fast as I could ru-uu-uun”) and discovered the culprit, Coco Noir. To this day I still haven’t actually smelled CN, but if peer review is any indication… run away, run away… from this one. Oh dear! She must have really doused you. Living among rows of linden trees, it’s one of my favorite scents too. So a big thank you for the rec. You *are* a goddess. My last wander through Nordstroms was pretty unmemorable. At the enthusiastic suggestion of an SA, I *did* try one of the new Jo Malones–don’t recall what it was called, but it smelled like raspberries and strongly reminded me of the VS body sprays my students douse themselves in. Red berries and chemicals. Guessing that was Elderflower & Gooseberry, or something in that last sweet collection. Yes, I think it *was* in that collection–maybe the Redcurrant and Cream? I wanna say it was pink. . . Yes, then one of those two I’d think. I have to admit i did not even bother to smell Oscar and Kate.. I liked Shalimar Parfum Initial L’Eau at Canadian Sephora , but I am not sure it is from 2013..
Ack, I can’t remember either! I vote for Marni and Dolce & Gabbana The One Desire as best mainstream, so far. Live Color Fully smelled really plasticky to me. I think this is currently exclusive to Nordstrom and I like the way the bottle is shown in the window display with a mannequin wearing a mini-skirt made of 2 layers of brightly colored plastic. I also noticed on 1000 Fragrances that Octavian seemed to be saying something positive about EL Modern Muse, so I’ll give it a sniff if I see it. The other one I want to try is Aramis Calligraphy. I think it came out last year but is only now showing up at Nordstroms. I don’t often go to department stores anyway, but I was just looking at the new perfumes on Surrender to Chance to see if there were any mainstream perfumes I wanted to try, and there weren’t. It is indeed a lean year so far. Correction: the Aramis Perfume Calligraphy is at Neiman Marcus. I am interested to see if that one is actually in NM stores…going to look this weekend. True, that recent post was really about online sources; I guess it could be online only. I’m definitely not ordering unsniffed!